Summary and Definition: The Kathlamet tribe were amongst the Native American Indians who changed the shape of their heads to a flat, elongated shape and nicknamed 'Flatheads' by the Europeans. The Kathlamet tribe were part of the Chinook nation and were amongst the Native Indians encountered by the Lewis and Clark expedition in 1805/6. The Kathlamet were traders, hunters and fishers who lived along the Columbia River. The Kathlamet tribe were a Native American Indian people, members of the Chinook nation, who controlled areas on the south side of the Columbia river in modern day Oregon, about four miles below Puget Island. Their tribal name comes from the Chinookan word “calamet,” meaning “stone” and was given to the Kathlamet tribe because they lived along a stretch of rocky river bed. The Kathlamet people were organized into villages and settlements that consisted of plankhouses made from the cedar trees. The Kathlamet tribe were many of the Northwest Native American Indians who used tattoos to decorate their skins and artificially re-shaped their heads according to the traditions of their people. This dramatic change in their appearance and their elongated, flat heads led to the nickname of 'Flatheads'. Refer to the Flathead article to learn more about their lifestyle and method of creating the elongated and flat shape of their heads. As can be seen by the following map the people of the Kathlamet tribe lived in close proximity to many other Native Indian tribes. 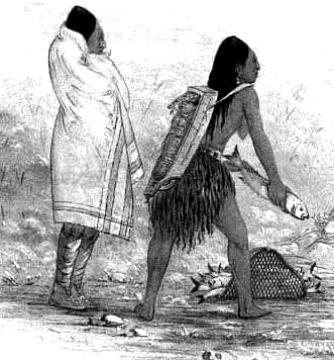 There lifestyle was similar with their neighbors and details of the types of clothes they wore, their religion, the food they ate, their plankhouses and their canoes. For details of their way of life refer to the Chinook Tribe. In 1810 the Kathlamet moved across the Columbia River and joined the Wahkiakum tribe in a village at the present site of Cathlamet. Where did the Kathlamet tribe live? The Kathlamet are people of the Northwest Coast Native American cultural group, often referred to as Flatheads. The location of their original tribal homelands were on the south of the Columbia River in what is now the State of Oregon. The geography of the region in which they lived dictated the lifestyle and culture of the tribe. The location of their villages were along the south side of the Columbia River. The Kathlamet people later moved north joining the Wahkiakums. The Lewis and Clark expedition made contact with the Kathlamet tribe in 1806. The following article, Journals of Lewis and Clark: Native Indians, provides details of their encounters with the Native American Indians who inhabited the region. Lewis and Clark reported "that about 300 Kathlamet occupied nine plank houses on the south side of the Columbia River",and lived between Tongue Point and Puget Island in Clatsop County, Oregon. On the north side, they lived "from the mouth of Grays Bay to a little east of Oak Point. Kathlamet History: What happened to the Kathlamet tribe? The tribal identity of the separate Kathlamet Indian Tribe eventually completely merged with the Chinook Native American Indians. The capital of Wahkiakum County, Washington, perpetuates the name of the Cathlamet.